It's time for another episode of 205 Live on the WWE Network! 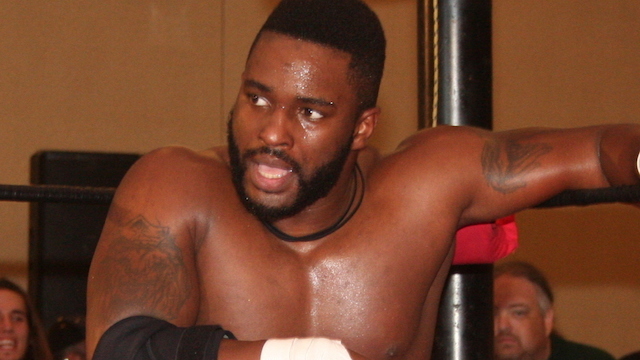 Cedric Alexander has proved that he belongs as champion and his era continues, but how much longer will it last? This Saturday, Cedric puts his Cruiserweight Championship on the line against Buddy Murphy in the challenger's hometown of Melbourne, Australia at WWE Super Show-Down. Will this be Alexander's final appearance on 205 Live as champ? Tune in for all the details. Hit F5 to refresh the live recap! 205 Live GM Drake Maverick hypes up the Cruiserweight Championship match that will occur this Saturday at WWE Super Show-Down, then previews two matches tonight: Tozawa vs. Gallagher, and Kalisto vs. TJP in the main event. Tozawa is fired up as he heads to the ring. Gallagher comes out next and he's accompanied by his partners Drew Gulak and The Brian Kendrick. They lock up, Gallagher backs him to the ropes, clean break, Tozawa shouts at him, Gallagher with a wristlock, Tozawa counters to a leglock, Gallagher reverses it with a Figure-4 to the legs, switches to a side headlock, backslide for 2, Tozawa with a jackknife cover for 2, Gallagher powers up and does a sunset flip for 2, Tozawa reverses for 2, Gallagher for 2, Tozawa for 2, Gallagher reverses but Tozawa rolls through and kicks him in the chest then hits the jumping senton splash for 2. Tozawa stomps him down in a corner, Gallagher picks him up, Tozawa chops him in the chest two times, fakes the third and connects the jab. Kendrick provides the distraction for Gulak to trip up Tozawa, Gallagher kicks him in the back of the head, mounted punches, covers for 2, hits a European uppercut, pummels him in a corner, Tozawa fights back but Gallagher keeps the offense with a chinlock. Tozawa tries to battle out but Gallagher with a snapmare, running shoulder tackle, covers for 2, Irish whip, back elbow, 2-count, then puts him in a chinlock using his own arm, takes him down, stomps on his arm, elbow drop, and back to the chinlock and switches to an armbar. Tozawa comes back with a jumping hurricanrana, back kick to the gut, misses the spin kick, sprawls under him and connects with the spin kick. Gallagher falls down near a corner, Tozawa goes up top, Gallagher rolls out the ring, so Tozawa charges at him with a suicide dive! Tozawa throws him back in, goes back up top, connects with the missile dropkick, covers and gets a 2-count. Gallagher blocks a suplex, Tozawa with a tilt-a-whirl into the octopus hold, but then Gallagher counters into a swinging sidewalk slam. Gallagher puts him in a single leg crab but Tozawa makes it to the ropes to break the hold. Gallagher slams his head on the turnbuckle, sets him up for a superplex, taunts the crowd, Tozawa blocks it, hits the DIVING SENTON BACK SPLASH and gets the 3-count! WINNER: AKIRA TOZAWA. Kendrick and Gulak are NOT happy about it, and the crowd boo them loudly. Gulak: "Alright, alright! It has come to my attention that our team is not living up to its full potential. So, Brian, Jack, simple people in attendance - I think it's in best interest to refer to an old learning tool of mine. So if everyone can please turn their attention to the TitanTron for myyyyyyyyyyyyyyyy POWERPOINT PRESENTATION!! That's right, Drew Gulak's Plan for a Better 205 Live edited by Drew Gulak, and if my notes serve me correctly I believe we were on Slide #10: No Mercy. (The cartoon picture drawing kinda looks like Brian Kendrick, so much so that the camera pans on him right after, and he doesn't look too pleased.) Mercy has its place but it's not in this ring. We had Cedric Alexander dead to rights a number of times, but we let him keep his reign and therefore we showed mercy, and in this ring mercy is weakness. Starting right now this team has no place for weakness, no please for sentimentality, no place for weak links. (Kendrick looks uneasy right about now.) No place for former Cruiserweight Champions who've lost their edge. (Uh-oh.) No place for people that are holding me back and nothing more than dead weight." KENDRICK ATTACKS GULAK AND GALLAGHER! He throws Gulak out the ring and puts Gallagher in the Captain's Hook! Gulak grabs Kendrick and puts him in the Gulock while Gallagher punches him in the ribs! Gulak stands over Kendrick and says, "You are weak and you have no place on this team." They leave, but then get back in the ring like vultures and attack him some more. The commentators try to understand the way of thinking from Gulak and his vision for a better 205 Live. Next we get a video package for the Cruiserweight Championship match between champion Cedric Alexander and challenger Buddy Murphy coming up at WWE Super Show-Down this Saturday at 5 AM ET/2 AM Pacific. Backstage, Kayla Braxton interviews GM Drake Maverick and asks him about the Hideo Itami vs. Mustafa Ali match from last week. He calls the ending reckless, gave them both the week off to recover, and alludes that this rivalry is not over. "It needs to come to a conclusion, and it is up to me to take drastic measures. Kayla, the next time that Hideo Itami and Mustafa Ali face off in a 205 Live ring, it's gonna be a match that nobody wants to miss." Next week, Lio Rush will issue an open challenge. Kalisto comes out, while Lince Dorado and Gran Metalik stay behind and head to the back. TJP comes out next and he's wearing a Lucha House Party t-shirt, then rips it up while taking it off and throws it at Kalisto. This match is a first-time ever meeting between these two former Cruiserweight Champions. The bell dings and this main event is underway. Kalisto with a rear waistlock, TJP takes control and trips him with a knuckle-lock, Kalisto keeps his shoulder off the mat, TJP pins him down for a 1-count, Kalisto pops up for a sunset flip, rolls through, TJP tries to do the same but Kalisto side-steps and trips him while still holding on with the knuckle-lock, pins him down for 1, TJP is pinned down for 2, pops up for own monkey flip but Kalisto lands on his feet. TJP kips up, Kalisto does his Lucha Lucha taunt, TJP throws him down, Kalisto hits a shoulder block, kicks, walks on his hands, backflips into a headscissors takedown, sweeps the leg, covers for 1 then puts him in an armbar. The crowd then starts a "Lucha Lucha" chant. TJP counters with a headstand headscissors, Kalisto jumps over a sweep attempt, then dances to taunt him. Kalisto rolls off his back for an armdrag, backflips to avoid a legsweep, does a headscissors takedown, TJP slides out the ring, Kalisto bounces off the ropes for a fake-out and taunts again, TJP slides back in, Kalisto rolls him up for 2, kicks him, walks on his hands again, but this time TJP dropkicks him. TJP connects with the springboard basement dropkick knocking him off the apron, rams his back into the barricade, throws him back into the ring, hits the slingshot senton, hard Irish whip into a corner and gloats. Kalisto pulls himself up with the ropes, fights back, TJP rolls through a sunset flip, goes for a leg submission, rips off the tail of Kalisto's mask, the crowd boos him, then he curb stomps Kalisto's chest into the mat and gets a 2-count. Kalisto reaches for the piece of his mask, TJP stomps on his hand, Irish whip, running back elbow, face twist, cover for 2, double armbar, Kalisto battles out as the crowd cheers for him and he hits a jawbreaker. Kalisto goes for a springboard but TJP is right there with him to hit a springboard Russian legsweep then transitions to the butterfly submission. TJP hits a backbreaker, stands on his head, mocks the Lucha taunt and dabs, hits a suplex, swings around, back suplex, 2-count, European uppercut, front slam, springboard corkscrew senton, covers for a near-fall, then puts him in the rear chinlock. Kalisto fights back, short superkick, TJP pops him up and drops him down, picks him back up, body slam, goes up top, stares at the crowd, mocks the Lucha taunt again, Kalisto rolls out the way, TJP rolls through, charges, Kalisto hits a back elbow, kicks him in the face, gets on the middle ropes, hits the seated senton, and follows up with the springboard corkscrew body block called Mexico City Twister. Kalisto rolls him up and hits the Listo Kick, basement 'rana connects, covers and gets a close near-fall. Both men are down, Kalisto is up on one knee, fires up with the taunt, TJP blocks the Solida Del Sol, tosses him over the ropes, Kalisto lands on the apron and kicks him in the head. Kalisto goes up top, TJP kicks him in the head, does a cross-armed mat slam, and covers for 2. TJP hops to the top, Kalisto with a jumping kick to the head, goes up to him, TJP tries to battle back, Kalisto headbutts him, another kick to the head, TJP is slumped backwards, Kalisto climbs back up to him, hits a VICTORY ROLL BOMB and gets 2.5! Kalisto calls for the finish, the crowd chants with him, TJP counters with a dropkick to the back of the knee then locks in the KNEEBAR. He grabs for the other leg, but Kalisto is using the free leg to crawl to the ropes. TJP drags him back to the middle, Kalisto crawls backwards to roll him up and gets a 2-count, TJP goes back to the submission hold, grabs the other leg and locks in the CLUTCH KNEEBAR! Kalisto teases tapping, finds the guts and determination and finally reaches the bottom rope to break the hold. TJP is mad, stomps on him, mounted punches, tries to yank the mask off, rips it open, LINCE DORADO RUNS DOWN FOR THE SAVE, but TJP punches him to knock him off the apron, goes back to his opponent, Kalisto rolls him up and gets the 1-2-3!! WINNER: KALISTO. Kalisto can barely stand on his injured knee following the submisson, so TJP clobbers him from behind and pulls the mask off!! Dorado is in the ring to chase him away but the damage is already done. Gran Metalik is in the ring as well to aide his amigo while TJP holds up Kalisto's mask in his own victory. Dorado and Metalik challenge him to get back in the ring, while TJP says he'll do that to all of them. That's all for 205 Live!